Want to join the "International Hall of Honor Web Ring"? 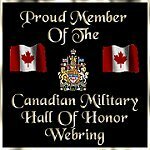 "Canadian Military Hall Of Honor"
"Al Varelas - United States Marine"
Military Control Center Web Ring? This Support Our Soldiers site owned by Al Varelas - USMC.
" Military Order Of The Purple Heart Web Ring"
This Veterans Service Organizations Ring site is owned by Al Varelas - USMC. "Thank You Persian Gulf Troops Web Ring"
Please Take A Moment To Visit The "Internatonal Hall Of Honor"
Want to join the "Thank You Persian Gulf Troops Web Ring"?